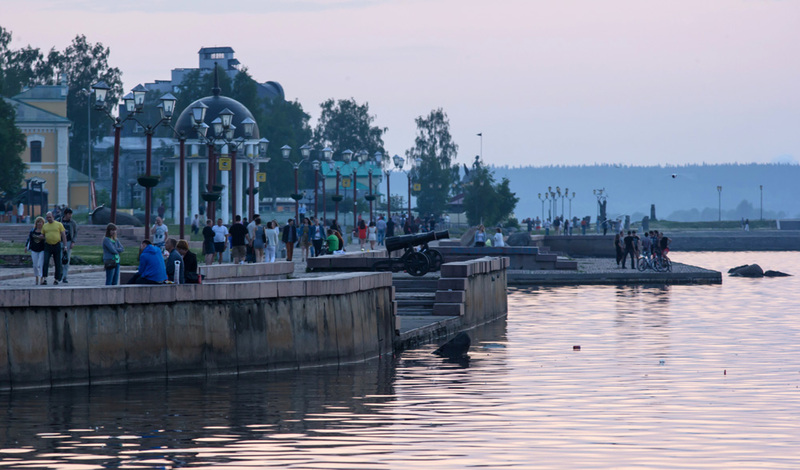 Embankment of Petrozavodsk during white nights. More than 80 years ago, several thousand American Finns arrived in the Soviet republic of Karelia, hoping to build a new life in harmony with their socialist ideals. What mark did they leave in history, and did the reality of the Soviet Union meet their expectations? It is New York, in the year 1932, at the height of the Great Depression. A horn sounds and a ship, gradually picking up speed, starts moving away from the harbor. Many of the passengers gathered on the deck, mainly young men, start hugging and congratulating each other. Recent immigrants, residents of the United States and Canada of Finnish origin, they are now sailing back to Europe, with an eye on reaching the Soviet Union to begin building a new and just socialist society. They believe that in the Soviet Union they will not starve or suffer persecution from the powerful. At the beginning of the 20th century, left-wing ideas enjoyed great popularity among the Finns as well as among other Europeans. When in 1918 in Finland the communist Red Guards lost a short but fierce civil war to The White Guard under military leader Baron Carl Gustaf Emil Mannerheim, tens of thousands of "Red Finns" crossed the border and settled in Russian Karelia, the vast region of pine forests and lakes north of modern-day St. Petersburg. One of the leaders of the Comintern, Edvard Gylling, rose to the head of the Karelian Labor Commune, the prototype of the present-day Republic of Karelia; he was a Ph.D. and a staunch Bolshevik. The new Soviet government faced the challenge of developing the ruined economy of the region, and then the Soviet leaders remembered their compatriots in Northern America. Over the past decades, Finns had emigrated en masse to the U.S. and Canada in search of a better life. However, the Americans themselves had been through a lot – the North American continent was hit by the Great Depression, a period in which life was doubly hard for recent emigrants. So it was no surprise that the Comintern’s call found sympathetic ears among those with socialist leanings. "Now Canada is the land of suffering. It is awful to look at groups of poor people, cold and hungry, roaming the streets and sleeping in trains, under bridges — anywhere they can lie down. Clashes between the starving crowds and the police are of common occurrence, but the workers usually fail because they don't have guns, and the police is heavily armed.... Many people are leaving for Russia. I think all the immigrants will leave, if only they have money. I also really want to leave, but my husband is against it, so I have to stay here in this terrible poverty," Aino Norkooli wrote to her mother in 1932. It was not only due to economic difficulties that American Finns were keen to move to the USSR. Many sincerely believed in the ideals of socialism. They sold their houses, cars, and other valuables, sent the money for the development of the Soviet economy, and then left, taking only what they could carry in their hands. They believed that in the country of the workers and peasants, they wouldn’t be hungry and homeless. The exact number of American Finns who moved to the USSR is unknown. Besides, some of them, having faced with the realities of Soviet life, preferred to go back to the U.S. However, Russian historians say that in the late 1920s – early 1930s about 6,000 American Finns, mostly young men, came to Karelia. They were to play an important role in the history of the region. "They left their mark in the history of the formation of national literature and national theater in the region; the first orchestras were mainly Finnish,” said Irina Takala, a history professor at Petrozavodsk State University in the region’s capital. “The water supply system in Petrozavodsk was built by the American Finns. Nevertheless, they played a particular role in the development of the timber industry in the region,” she said. “The Finns brought new knowledge, new technology, machines and cars, from America and Canada. For example, in 1932 only 2 percent of felled wood was exported using machinery traction (the rest were dragged by horses or manually), but in 1937, this figure increased tenfold, up to 20 percent,” said Takala. First, the governing body was dismissed and arrested, then it was the turn of suspicious idealists who had come to Karelia from overseas. The crackdown was harsh – while Finns ("Reds" and "Americans") amounted to only 3 percent of the population, Finns made up almost half of the prisoners in the years of 1937-1938. In addition, the sentences were severe – 85 percent of the convicts were shot. Shortly before the Soviet Union invaded Finland in 1939a new round of repressions took place in Karelia: Those who remained were "evacuated" into the interior of the country. The authorities feared that in case of war with Finland the call of the blood would be stronger than proletarian solidarity. This fear, however, was never confirmed – those Finns who hadn’t fallen victim to the repressions subsequently served honestly in the Red Army in World War II, with more than one being a Hero of the Soviet Union. After the Soviet Union reconquered the region from Finland at the end of WWII, the American Finns were permitted to return to Karelia. In the seventies Karelia underwent a genuine renaissance of Finnish culture, but this came to an end during perestroika, when free access to the West was allowed. The majority of Finns preferred to move to neighboring Finland, by now a prosperous and progressive modern state, thereby completing the circle that their ancestors had begun a century ago by going across the ocean in search for happiness. “My grandparents were real romantics who had come from America to the USSR to build a new fair life. Unfortunately, their dream turned into a tragedy,” said Arthur Myaki, head of the Karelian State Committee for Tariffs, who is perhaps the region’s best-known descendant of the American Finns.